Google YouTube grabber, there will appear tons of effective video grabbers on your radar. Among them, video grabber stands out of the crowd as the famous online video grabbing app for you to download video from video-sharing sites like YouTube. Well, one thing to note is that this totally free video grabber is only workable on Windows, which is definitely a devastating blow to Mac users. But this doesn't mean that you can't download YouTube video on Mac. You can rely on video grabber alternative, as well. 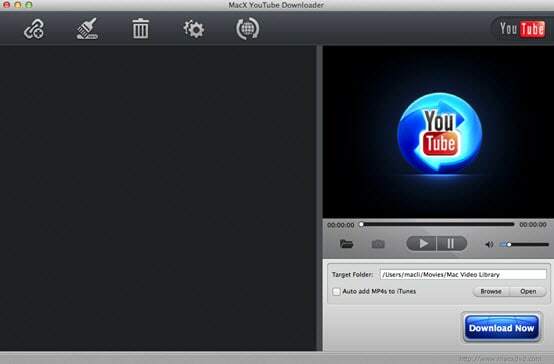 MacX YouTube Downloader? It will pack your satisfaction, I promise. Living up to its reputation, this top-ranking YouTube video grabber for Mac specializes in downloading any YouTube video with splitting speed and 1:1 original quality reserved thanks to its mighty advanced tech support. Moreover, for YouTube HD video enthusiasts, here comes a piece of good news that you can apply this astonishing video grabber to download video music from Facebook, Dailymotion, Vimeo, Vevo, Myspace, Metacafe, etc. 1000+ video sharing sites in 720P, 1080P, even 4K (4096 x 2160) 8K UHD in a flash, not merely limited to download YouTube video in FLV, MP4, MOV, AVI, 3GP format with just a click away. After free downloading this free video grabber for Mac, run it. Open your web browser and the YouTube video you'd like to download. Copy and paste the video URL to the message box and then click "analyze" or "paste & analyze" button to load the YouTube video. 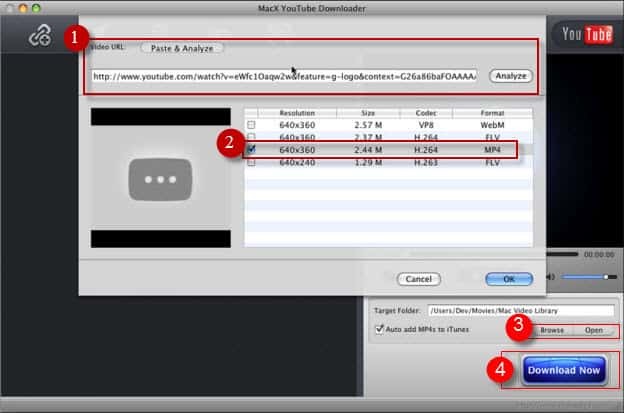 And this distinguished YouTube video downloader will automatically detect the YouTube video. When downloading several YouTube videos at one blow comes to you, this remarkable YouTube grabber for Mac will pull out all the stops to aid you to download them in one breath with barely several mins needed. Specify output folder on your computer to save the output files. Click the "Browse" button to choose the path where you want to save the output YouTube videos in. Click "Download Now" button to start grabbing video from YouTube on Mac. After the downloading procedure done, you can eventually enjoy your YouTube videos on Mac without any hinders. Note: It's admitted that the free products are capacity-constrained, and this fascinating YouTube video downloader for Mac is no exception. If you thirst to put the downloaded YouTube video to your latest portable devices for playback with no limitations, its advanced version MacX Video Converter Pro fits the bill to let you convert any YouTube video to iPad mini 4 Retina/Air 2, iPhone Xs/Max/XR, Samsung Galaxy S9 edge/Note 9, Sony, Microsoft, Xbox One, etc. as easy as 1, 2 and 3. What's more, when encountering the non-downloadable YouTube video, this omnipotent video converter can also assist you to record YouTube video via its progressive online video recording feature.